For millennia, humanity has mastered tools to further its goals. But what if technology became the master? Imagine a world where robots rule – a tomorrow where imagination is outlawed. 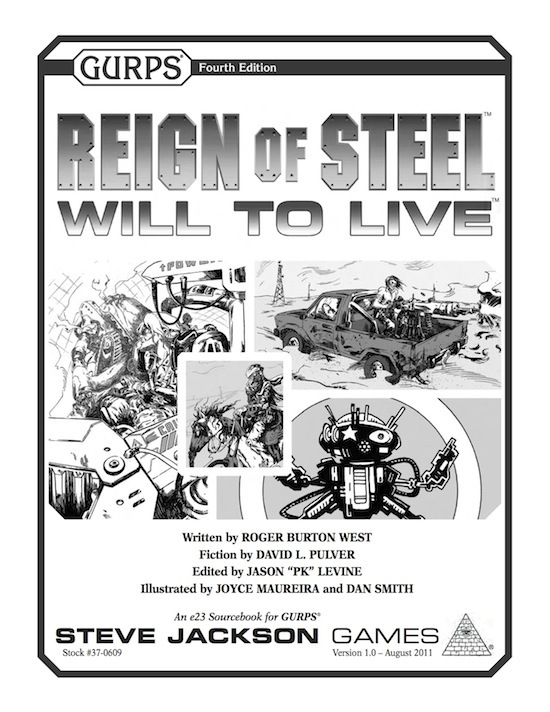 Full GURPS stats on the robots from Reign of Steel – over 30 write-ups in all! All the enemies from that setting are now presented as GURPS Fourth Edition characters, for maximum portability and ease of use. Heroes can fight the 351-point XNU-09 Stalker security sentries, find the 436-point "doppelganger" RAU-06 Lilith models, or flee the 6,470-point XAU-03 Juggernaut battle tank! Advantages, disadvantages, perks, and quirks used by robots – plus 20 weapons! 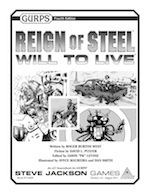 For the background info and systemless details necessary to make full use of GURPS Reign of Steel: Will to Live, the original GURPS Reign of Steel supplement is invaluable! For more details on the technology and equipment used in the grim future of Reign of Steel, check out GURPS Ultra-Tech. For high-octane Reign of Steel campaigns that focus on cinematic shooting, GURPS Gun Fu gives heroes the edge they may need to survive! To help set the right tone for a technologically tormented tomorrow, GURPS Horror gives helpful thematic advice. For campaigns that focus on salvaged and improvised gear, GURPS High-Tech and GURPS Low-Tech can both prove useful. What does the future of the Reign of Steel setting hold? Check out David L. Pulver's "Reign of Steel: Deep Space" (from Pyramid #3/71: Spaceships II), a continuation of the timeline and history that takes the fight against the robots into the void!